To highlight a potentially fatal complication of broncho-vascular fistula arising from the self expanding metallic stent (SEMS) placement. We retrospectively analyzed five patients with benign and malignant airway diseases, who developed tracheo/broncho-vascular fistulas following SEMS placement in our tertiary care setting. All patients received either Wallstent or Ultraflex® stent (Boston Scientific, Natick, MA) between 1999 and 2007. All patients had received adjunct therapy such as balloon bronchoplasty, laser therapy or electrocautery. Most patients presented with massive hemoptysis. A total of 483 SEMS were placed during this period. SEMS placement can be complicated by Broncho-vascular fistula formation. True incidence and precise time interval between the insertion of stent and onset of this complication is unknown. Additional therapeutic modalities to maintain stent patency may enhance the risk of fistula formation. SEMS should only be used in a select sub-group of patients, after exhaustive evaluation of other treatment options. These cases provide evidence that broncho-vascular fistulas can develop at any time following SEMS placement, suggesting the need for a more cautious approach, especially while using them for a long term management. In benign airway disease, the stent should be removed as soon as healing has taken place. Management of central airway obstruction, from both benign and malignant diseases, is one of the most challenging aspects of respiratory medicine. Airways stenting is a reliable palliative approach to maintain airway patency. Endobronchial stenting of airways has made long strides since its beginning in 1960s. Given the ease of placement, self-expanding metallic stent (SEMS) had become very popular in recent past. Unfortunately, the initial enthusiasm in SEMS placement was dampened by a frequent complication of excessive granulation tissue formation and difficulty in its removal. Incidentally formation of broncho-vascular fistulas (BVF) is also a major complication of SEMS yet reported less frequently. In fact, Food and Drug Association (FDA) published a warning in favor of a more restrained approach for airway stent placement. We describe a series of five cases treated with SEMS placement and suffered with BVF. Purpose of our report is to highlight the complication by supporting our experience with the review of the literature. A 50-year-old male, underwent double lung transplant for idiopathic pulmonary fibrosis (IPF). Two weeks following his transplant, he was readmitted with acute onset of severe shortness of breath. 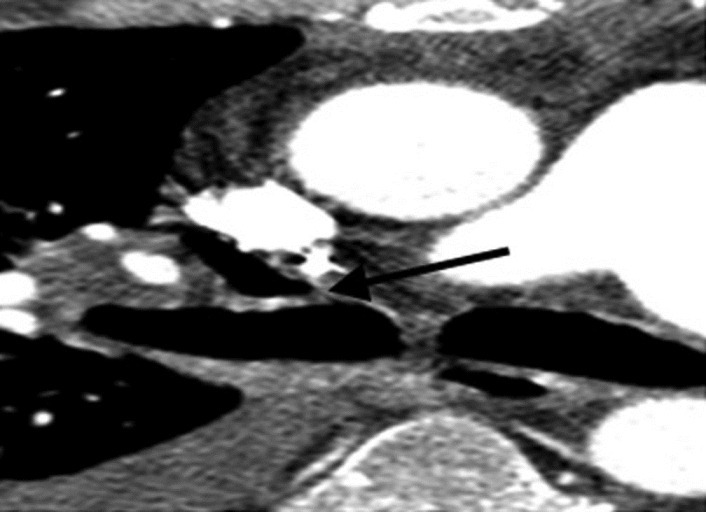 His Computed tomography (CT) of the chest revealed a small air collection adjacent to right anastomotic site with bilateral pleural effusions. His echocardiogram demonstrated large circumferential pericardial effusion with tamponade physiology. The pericardial fluid was evacuated by a pericardial window and a right sided chest tube. Flexible bronchoscopy (FB) was performed the same day, which confirmed bilateral bronchial dehiscence, worse on the right, with a 1.5 cm defect of antero-lateral wall of right main stem bronchus with separation of suture line from donor bronchus [Figure 1]. There was a free moving flap and full thickness necrosis of the wall which extended down to bronchus intermedius. A 14 mm × 40 mm uncovered Ultraflex® SEMS was deployed over a guidewire in the right main bronchus to bridge the dehiscence. With bronchoscopic forceps, the stent was gently repositioned firmly against the secondary carina in an effort to cover the defect. A 12 mm controlled radial expansion (CRE) balloon was used to dilate the stent across the area of the anastomosis. The balloon of smaller diameter was used to avoid undue high atmospheric pressures at the site of disruption. At the end of the procedure, the stent was in a visibly good position. Patient was doing well at home for 3 weeks when he experienced a sudden massive hemoptysis. In emergency, his airway was noted to be filled with blood and he had right sided hydropneumothorax. He died shortly after arrival in the emergency department. Considering his recent intervention and stent placement, we concurred that BVF was the most likely mechanism of his massive hemoptysis. Unfortunately, family refused an autopsy. A 73-year-old female, ex-smoker with 4 pack-year of smoking history was diagnosed with ovarian adenocarcinoma at 67 years of age. She underwent surgery for local spread of tumor in addition to chemotherapy. Five years following the initial diagnosis she developed a lung lesion and supraclavicular lymphadenopathy. Biopsy from both lesions revealed adenocarcinoma. She received chemotherapy along with external beam radiation. She presented with recalcitrant cough and left lower lobe collapse due to stenosis of the left main stem bronchus from extrinsic compression. A covered 12 mm × 40 mm Ultraflex® SEMS was placed in the left main stem endobronchial lesion with symptomatic and radiographic improvement. Four months following the procedure, the patients developed recurrence of her cough; FB revealed ingrowths of granulation tissue involving the distant third of the stent and an ulcer in lower third of trachea. Bronchial brush cytology was negative for malignant cells. She underwent two separate endobronchial multimodality treatment for debulking of the granulation tissue using electrosurgery, cryoablation, balloon bronchoplasty, and intrabronchial steroid injection. She started experiencing hemoptysis 4 months after her last procedure and a year after initial stent placement. Bronchoscopy revealed blood oozing from stent site in left main stem bronchus. 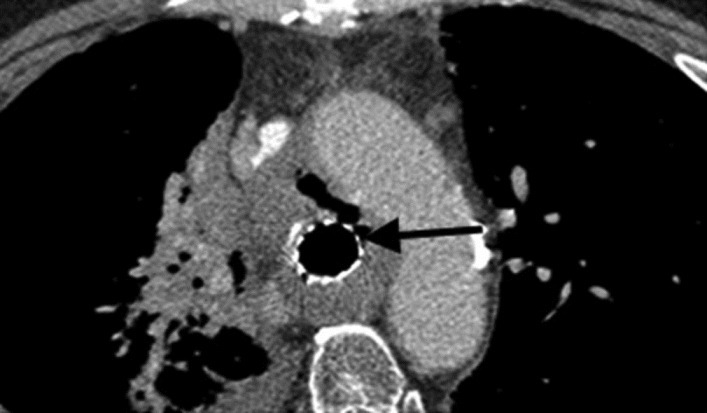 Her CT of chest with contrast showed loss of the tissue plane between the stent and the left pulmonary artery with metallic stent eroding into the left pulmonary artery [Figure 2] and [Figure 3]. She continued to have recurrent hemoptysis for next 1 year and eventually passed away from exsanguination. A 49-year-old man underwent double lung transplant for Idiopathic Pulmonary Fibrosis and pulmonary hypertension. 10 months following the transplantation he developed breathlessness and wheezing. Bronchoscopy revealed a near total obstruction of the right main bronchus by a whitish, exophytic lesion, which was excised and airway was dilated. Biopsy of the endobronchial lesion revealed an aspergilloma. The patient was appropriately treated with systemic and topical antifungals. Subsequently, he underwent Ultraflex® SEMS placement and brachytherapy (dose - 7.1 Gy × 2) in the right bronchus for excess granulation tissue. He improved initially but two months later developed worsening hemoptysis. While hospitalized, he developed cardiac arrest following massive hemoptysis and required an urgent right pneumonectomy. Decision to perform pneumonectomy was based on clinical suspicion of BVF, a diagnosis compatible with his presentation. Intraoperatively, 1 cm defect in posterior right pulmonary artery was noted, communicating with the SEMS in the right bronchus intermedius. Stent could be grasped from the pulmonary artery but unfortunately he expired the next day. A 53-year-old male underwent right lung transplantation for severe chronic obstructive pulmonary disease (COPD). He subsequently developed right anastomotic dehiscence requiring Ultraflex® SEMS stent 14 mm × 40 mm placement in right main bronchus. Patient continued to have recurrent in-stent restenosis treated with Neodymium-doped yttrium aluminum garnet (Nd-YAG) laser, balloon bronchoplasty and electrocautery between 14 and 39 months post stenting. Two months following his last intervention, he presented with wheezing. Electrocautery was attempted to dilate his anastomotic stenosis, but was complicated by 400 ml of bleeding. 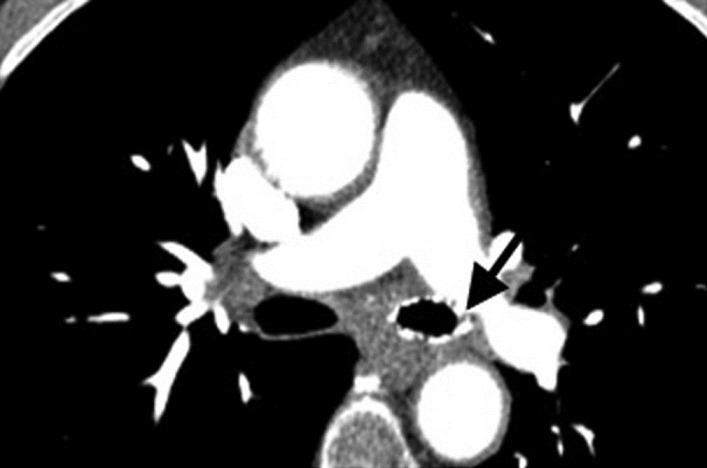 On review, his CT scan of chest demonstrated metallic stent, bridging the anastomosis closely applied to posterior aspect of right main pulmonary artery [Figure 4]. He was eventually discharged home and died within a few days from massive hemoptysis. A 65-year-old female, diagnosed with non-small cell lung cancer developed respiratory distress and hypoxia requiring a bronchoscopy. It revealed tracheal narrowing due to extrinsic compression from the tumor, in addition to complete occlusion of the left main bronchus due to endobronchial invasion. Extensive tumor debulking was performed using Nd-YAG laser and balloon bronchoplasty. A covered Ultraflex® SEMS 18 mm × 60 mm was placed into distal trachea extending into the left main bronchus. Patient completed her radiotherapy and chemotherapy course. Seven months post intervention patient, she started complaining of increasing wheeze and halitosis. Repeat bronchoscopy revealed tumor ingrowths into the stent, broken stent wires, and a tracheo-mediastinal fistula noted at distal end of the stent. Laser photoresection was done to maintain stent patency. 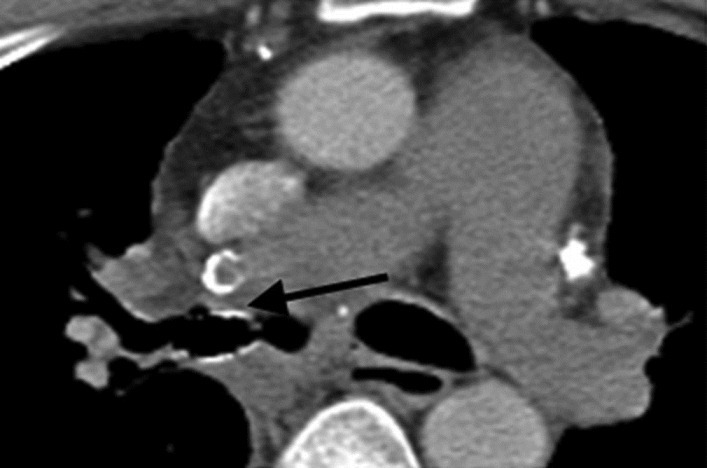 A week later she developed hemoptysis and CT of the chest revealed pneumo-mediastinum from tracheo-mediastinal fistula with irregular medial contour of the aortic arch consistent with invasion of the aorta [Figure 5] requiring transition to hospice care. Between 1999 and 2007, total 483 SEMS were inserted at our institution. Five of these patients developed BVF and eventually succumbed to the complication. Average age of patients was 58 (49-73) years, male to female ratio of 3:2. Three patients had airway dehiscence following lung transplantation and two had malignant disease. All patients except one received additional endobronchial therapy including photocoagulation, cryotherapy, balloon bronchoplasty, or electrocautery to mange complications of the stent. Mean duration of fistula formation was 16 (1.5-65) months [Table 1]. Advent of SEMS with improved design and deployment has led to their increased used in a variety of tracheobronchial disorders. SEMS are made from a nitinol base alloy and their advantages include, ease of insertion, shape memory to conform to tortuous airways, greater cross-sectional area and preservation of mucociliary clearance. However, these advantages are often offset by numerous potential problems. Several studies have shown complication rates approaching 50%. , Common complications are mucus build up (38%) leading to infectious tracheobronchitis, halitosis, obstructing granulation tissues or tumor ingrowths (36%), and stent migration (12%). Other complications reported are stent fatigue or fracture, complications associated with attempted stent removal,  trachea/broncho-esophageal fistula and BVF formation. , Incidentally, anastomotic dehiscence following lung transplantation is often treated with placement of SEMS. If left on place for long durations, these patients may develop stent obstruction from granuloma formation requiring further interventions. This complication is reported anytime post-stenting, from early days or weeks to years after its placement. Our timescale is consistent with what described in literature. Interestingly, all the reported cases in literature developed fistula after stent placement in either Trachea or left main bronchus. In contrast, three patients in our series had right main stem stent placement, one each in trachea and left main bronchus. There is no universally agreed practice regarding when an airway stent should be removed, particularly in benign airway disease. There are conflicting evidences in literature regarding outcome after early stent removal. , None of the stents were removed in our group for either therapeutic reasons or because patients tolerated it initially. Although rare, SEMS placement can result in fatal complication such as BVF formation at any time after SEMS implantation. Despite its usefulness, these devices are best considered as last resort for tracheobronchial diseases. SEMS should only be used after ruling out other potentially safer options, especially for long term treatment in benign airways diseases especially among lung transplant recipients. 1. Santacruz JF, Mehta AC. Airway complications and management after lung transplantation: Ischemia, dehiscence, and stenosis. Proc Am Thorac Soc 2009;6:79-93. 2. Lund ME, Force S. Airway stenting for patients with benign airway disease and the food and drug administration advisory: A call for restraint. Chest 2007;132:1107-08. 3. Rousseau H, Dahan M, Lauque D, Carré P, Didier A, Bilbao I, et al. Self-expandable prostheses in the tracheobronchial tree. Radiology 1993;188:199-203. 4. Madden BP, Loke TK, Sheth AC. Do expandable metallic airway stents have a role in the management of patients with benign tracheobronchial disease? Ann Thorac Surg 2006;82:274-8. 5. Lee P, Kupeli E, Mehta AC. Airway stents. Clin Chest Med 2010;31:141-50. 6. Saad CP, Murthy S, Krizmanich G, Mehta AC. Self-expandable metallic airway stents and flexible bronchoscopy: Long-term outcomes analysis. Chest 2003;124:1993-9. 7. Swanson KL, Edel ES, Prakash UB. Complications of metal stent therapy in benign airway obstruction. J Bronchol 2007;14:90-4. 8. Wood DE. Airway stenting. Chest Surg Clin N Am 2001;11:841-60. 9. Gaissert HA, Grillo HC, Wright CD, Donahue DM, Wain JC, Mathisen DJ. Complication of benign tracheobronchial strictures by self-expanding metal stents. J Thorac Cardiovasc Surg 2003;126:744-7. 10. Lunn W, Feller-Kopman D, Wahidi M, Ashiku S, Thurer R, Ernst A. Endoscopic removal of metallic airway stents. Chest 2005;127:2106-12. 11. Sihvo EI, Sioris T, Tynninen O, Salo JA. Fatal fistula between the trachea and the brachiocephalic artery: Late complication of a second-generation, self-expanding metallic tracheal stent. J Thorac Cardiovasc Surg 2006;131:1415-6. 12. Nashef SA, Dromer C, Velly JF, Labrousse L, Couraud L. Expanding wire stents in benign tracheobronchial disease: Indications and complications. Ann Thorac Surg 1992;54:937-40. 13. Asopa S, Moorjani N, Saad RA, Turner JT, Amer KM. Rare and fatal complication of Gianturco tracheobronchial stent. Ann Thorac Surg 2007;84:1758-60. 14. 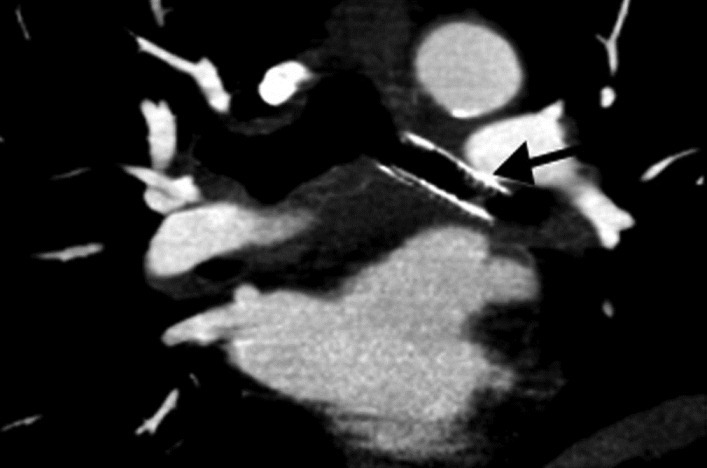 Katayama Y, Suzuki H, Mizutani T. Aorto-bronchial fistula after implantation of a self-expanding stent in a patient with aortic dissection. Jpn J Thorac Cardiovasc Surg. 2000;48:73-5. 15. Lim LH, Cotton RT, Azizkhan RG, Wood RE, Cohen AP, Rutter MJ. Complications of metallic stents in the pediatric airway. Otolaryngol Head Neck Surg 2004;131:355-61. 16. Sesterhenn AM, Wagner HJ, Alfke H, Werner JA, Lippert BM. Treatment of benign tracheal stenosis utilizing self-expanding nitinol stents. Cardiovasc Intervent Radiol 2004;27:355-60. 17. Song HY, Shim TS, Kang SG, Jung GS, Lee DY, Kim TH, et al.Tracheobronchial strictures: Treatment with a polyurethane- covered retrievable expandable nitinol-stent: Initial experience. Radiology 1999;213:905-12. 18. Chua AP, Budev M, Mehta AC. Late airway anastomotic dehiscence associated with sirolimus and migratory staples in a lung transplant recipient. Transplantation 2010;89:1293-4. 19. Cordasco E, Rice T, DeBoer G, Mehta AC. Fatal mistaken identity: Letter to the Editor. Am Rev Respir Dis 1991;144:469-70. 20. Gotway MB, Golden JA, LaBerge JM, Webb WR, Reddy GP, Wilson MW, et al . Benign tracheobronchial stenoses: Changes in short-term and long-term pulmonary function testing after expandable metallic stent placement. J Comput Assist Tomogr 2002;26:564-72.